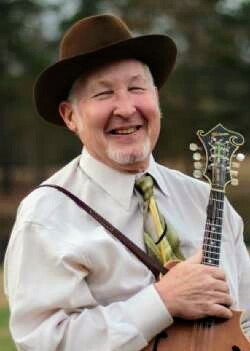 Chris has been singing and playing bluegrass music since the 1960s, and was a member of the band "High Country" from 1970 to 1976, when Chris earned a living as a professional bluegrass musician. High Country has been known as the premier bluegrass band on the west coast of the U.S. from the early 1970s onward. During his tenure as High Country's lead vocalist, Chris recorded two albums with the band on Warner Brothers Records. After moving to South Carolina around 35 years ago, he has been a fixture on the bluegrass scene in the Palmetto State. Chris has played in numerous bands over the years, including High Country, Amick Junction, High Lonesome, Anna and Shellie Davis and the Unnamed Bluegrass Band, and the Claude Lucas Band. You're sure to enjoy Chris' smooth vocals. He is a walking encyclopedia of bluegrass knowledge, and you will be challenged to find another vocalist who knows the lyrics to as many songs as Chris does. Chris was selected as the 2014 Recipient of South Carolina's Jean Laney Harris Folk Heritage Award for his contributions to preserving traditional bluegrass music. Chris is a founding member of Palmetto Blue. Shellie Davis is no stranger to the bluegrass music scene. She has been playing the bass and singing in bluegrass bands since she was 8 years old. Shellie played in the band Anna and Shellie Davis and the Unnamed Bluegrass Band, and made her first studio recordings when she was 10 years old. Shellie keeps a rock-solid beat, and can sing sweet harmonies and has her share of songs on which she sings lead vocals. Although Shellie is rooted in the time-proven bluegrass traditions, she also keeps us on our toes by bringing current songs to the band. She also encourages us to experiment with non-traditional material such as bluegrass takes of Beatles songs or working up a Mumford and Sons song. 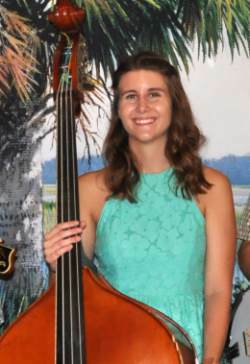 When she's not playing the bass and singing with Palmetto Blue, Shellie spends her time as a student at Clemson University, where she's majoring in Pre-Med and was a founding member of the Clemson Bluegrass Ensemble. She excelled in high school academics and extracurricular activities, and was the Student Body President and among the top students in her class. Even though she's a full time college student these days, she still finds plenty of time to be an integral part of our band. Shellie is a founding member of Palmetto Blue, and we are proud to have her as a member of our band! Steve Willis has been playing banjo since the mid 1970s. At age 15 he bought a $98 banjo from K-Mart, and was and was soon hanging out with Little Roy Lewis on Tuesday night tapings of their Lewis Family show on TV station WJBF in Augusta, Georgia, learning banjo licks from Little Roy. It wasn't long before he had saved enough to get a better banjo. He was soon playing with Ed Hurt and the Cross Country Express, which included award winning fiddler George Pritchard. During his teenage years he played banjo for radio commercials and won several first place titles in banjo contests. He got to play banjo for Mac Wiseman on a show, and was joined on stage by banjo legend Don Reno for a few numbers. In his early 20s, raising a family took priority, and Steve put his banjo down for nearly 30 years. We are glad that he has picked it back up again! His solid style is deeply rooted in the Scruggs tradition. Steve is a founding member of Palmetto Blue. Ella began playing the violin at the age of four when she enrolled in the University of South Carolina’s Suzuki program and with a private teacher in 2007. She continues to thrive as a classical student in this program and the local Philharmonic Youth Orchestra. In 2013, however, her musical approach began to broaden when she attempted to learn an arrangement that employed fiddling technique, but she encountered some difficulties in mastering such a diverse style of playing. Fortuitously, an article in The State newspaper featured an award-winning fiddler named Ashley Carder, who frequented Bill’s Pickin’ Parlor. At the next available opportunity, Ella visited the Pickin’ Parlor and met a regular, Van Price, who taught her a few bars of a popular fiddle tune. Since then, Ella was able to meet Ashley Carder and has benefited greatly from his expertise and insight. She also takes weekly fiddle lessons with Kristen Harris, another state-champion and old-time musician, and continues to add folk and traditional melodies to her repertoire. In 2017, Ella won first place in the South Carolina Junior Fiddle Championship. After guesting with Palmetto Blue for several years, Ella joined us as a permanent band member in 2017. In 2018 she won third place in the Youth Old Time Fiddle category at the prestigious Galax Fiddlers Convention in Galax, Virginia. Ella also is part of her family band, The Thomas Family, together with her parents and her two brothers. Ed Dalton has been playing the guitar since his childhood growing up in the Winston-Salem, NC area, where his dad would take him to bluegrass jam sessions. Ed grew up surrounded by bluegrass and old time music, where his dad played in bands with the likes of Joe Greene. Ed's grandfather was also a fiddler. Ed contributes some fine flatpicking guitar and vocals to the group, and has won several guitar contests over the years. 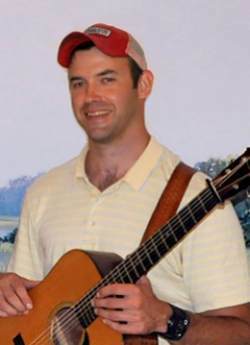 Since moving to South Carolina, he has been a fixture on the bluegrass scene and has played in several regional bands. Ed has been with us since January 2016, and we are proud to have Ed as a member of the Palmetto Blue team! 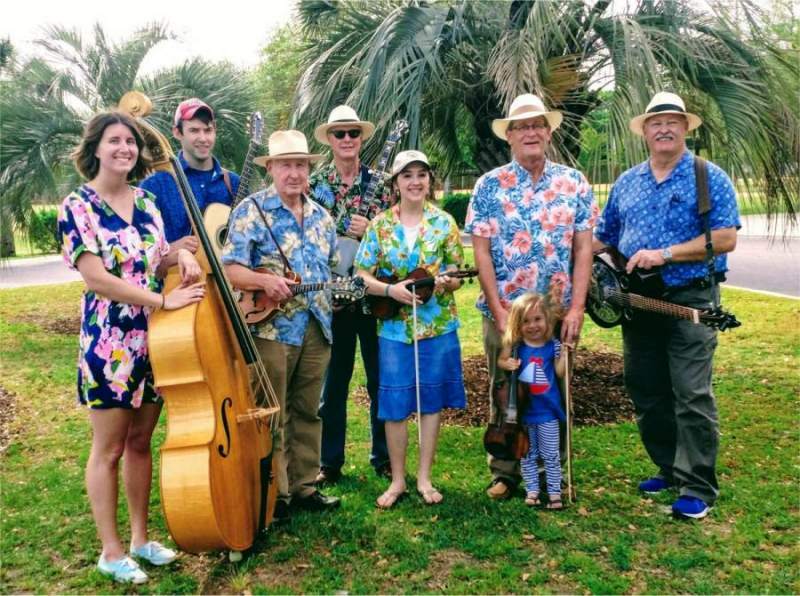 Ashley has been playing bluegrass and old-time music for over 35 years and has played in various SC bluegrass bands including Bill Wells and the Blue Ridge Mountain Grass, High Lonesome, Anna & Shellie Davis & the Unnamed Bluegrass Band, Old Growth String Band, and The Blue Iguanas. Ashley's style of fiddling is rooted in the old time and early bluegrass traditions. 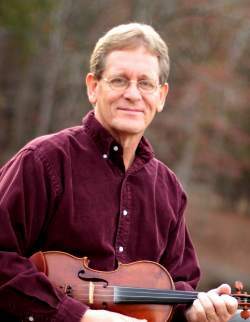 Ashley is a 2012 recipient of South Carolina's Jean Laney Harris Folk Heritage Award, which was also awarded to his fiddling mentors, Homer "Pappy" Sherrill in 1988 and Vernon Riddle in 1999. 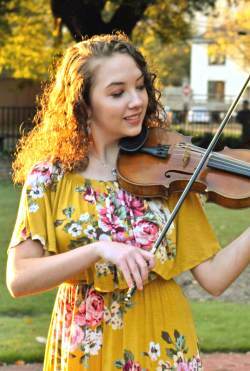 Ashley has been called upon to do presentations on traditional fiddling for college folklore classes, music clubs, public schools, youth groups, and college campuses in South Carolina and North Carolina. Ashley is a founding member of Palmetto Blue. Marty Carrigg joins us on dobro when he can, adding a sweet touch behind Shellie's vocals, and some nice dobro breaks throughout our shows. 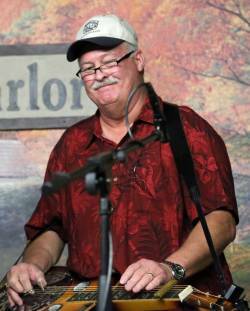 He has been involved in bluegrass music since his teens back in the late 1970s. Marty was a member of Southern Land and Cattle Company in the late 1970s and early 1980s, and recorded an album with them. Since then he has been a member of High Prairie Cowboy and currently plays dobro and banjo for Flatland Express. Marty helped out with some dobro on our latest CD. He can also pick a banjo with great skill and has been there to fill in as our banjo player during emergency situations. We all love Marty's tasteful dobro playing and are glad to have him as a member of our Palmetto Blue team! Darryl Hudson grew up in Warrenville, South Carolina listening to country music and watching The Lewis Family on Sunday afternon on WJBF in Augusta, GA. He got his first guitar at the age of 9 and played country and southern rock music into his teen years. Just out of high school he landed a job as a disc jockey at country music radio station WVAP in Langley, SC and found a pile of old bluegrass albums in the back room that seldom got played. One listen to a Flatt & Scruggs album and he was hooked on bluegrass! 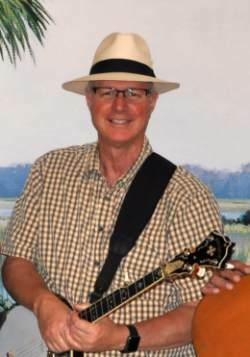 Darryl bought an upright bass and started playing bluegrass music in 1983 and played guitar and bass in various groups around the Aiken-Augusta area. 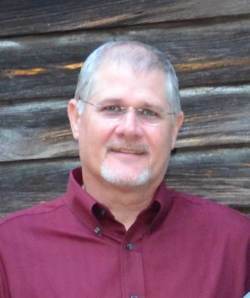 Now living in Aiken, South Carolina and playing guitar, Darryl sings lead and baritone vocals. He is also a long time and founding member of Savannah River Bluegrass. Darryl joined us in 2018 and we are happy to have him as the newest member of the Palmetto Blue team! 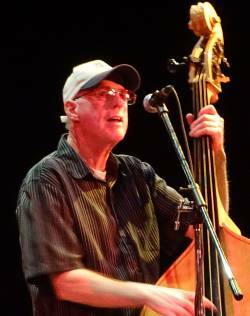 Pete began calling dances in 1975 around Philadelphia and Lancaster, PA. During the previous several years, he danced to and was influenced by the calling of Bill Hunn and Chris Sanderson, long-time callers from the Brandywine Valley area. Soon after, Pete began to travel to dances and festivals in VA, WV, NC and TN to learn local dance styles and share dances with other callers. In addition to hosting barn dances at his farm, Pete organized a monthly Community Center Square Dance in Chester County, PA, in 1980 that ran for 20 years. Pete's calling style emphasizes easy-to-learn figures that encompass traditional community dance styles from New England down through the South. Calls are incorporated with lively old time fiddle music with a goal of the dancers feeling and moving to the music. He will often add humorous and topical rhyming patter to suit the occasion. An award-winning clogger, Pete will demonstrate and teach this rhythmic dance style on request. Pete has been invited to call dances at The Smithsonian Folklife Festival, Brandywine Mountain Music Convention, and The Appalachian String Band Music Festival, among others. He has enjoyed teaching many school residencies that have introduced square dancing to a new generation. 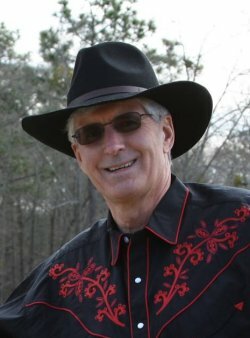 Since relocating to Aiken County, SC in 2008, Pete continues to call traditional square dances whenever and wherever requested. We partner with award winning classical musicians, violinist Sarah Land and cellist Ryan Knott, to offer services for events such as weddings, where you may want classical music for your wedding service but a bluegrass band for the reception. For a truly unique experience, we offer traditionally classical pieces with a bluegrass twist. 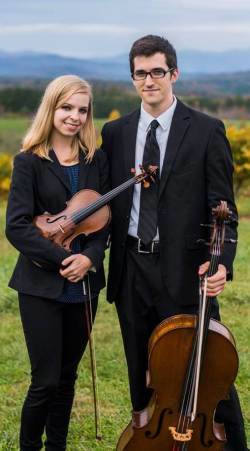 Visit our Listen page to hear our "down-home" take on the timeless classic, Pachelbel's Canon in D.
Ryan and Sarah are both graduates of the University of South Carolina School of Music. They wed in October 2017 and are now husband and wife! Our long time friend Bruce Moyer passed away unexpectedly on November 25, 2017. Over the years Bruce filled in or guested with us on bass numerous times and added some fine vocals and tenor harmony. Bruce was well known in the local bluegrass community and was a friend to all. We will miss sharing in the music with Bruce, but will forever be thankful for the times we shared and will cherish the memories. We put together the video below in memory of Bruce.